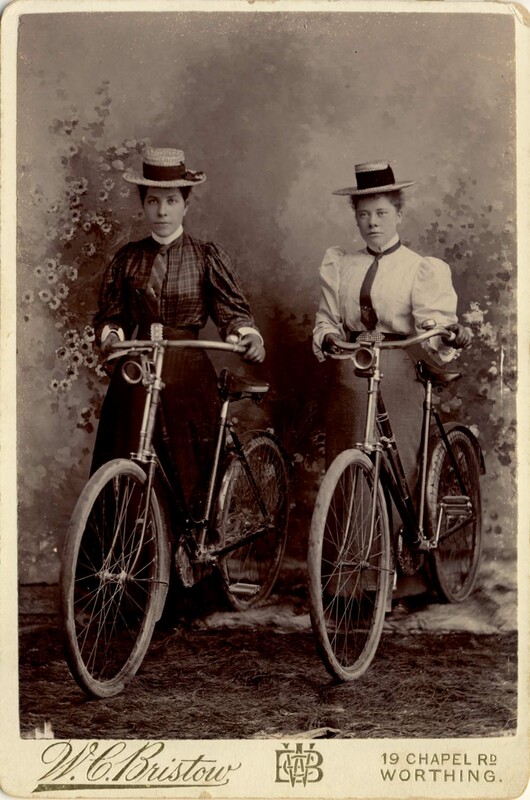 [ABOVE] A Cabinet portrait of two women cyclists by W. C. Bristow, 19 Chapel Road, Worthing (c1900). Studio Proprietor : Mrs Eliza Bristow. 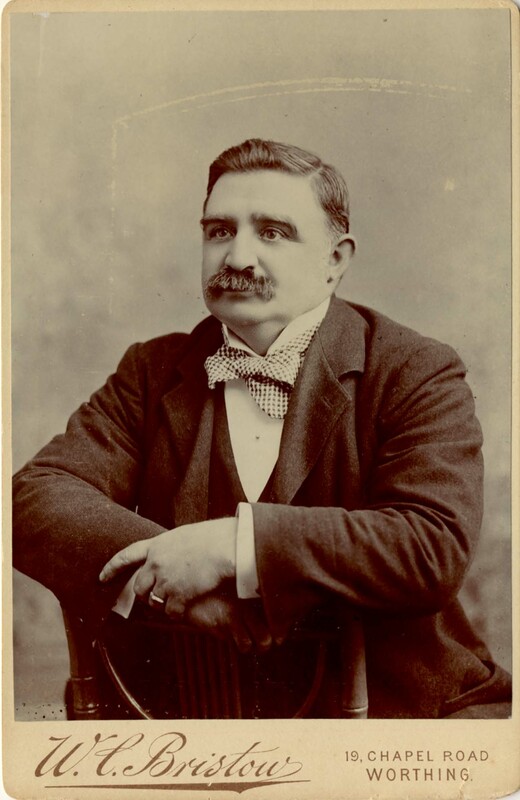 [ABOVE] A Cabinet portrait of a middle-aged man by W. C. Bristow, 19 Chapel Road, Worthing (c1898). Studio Proprietor : Mrs Eliza Bristow. 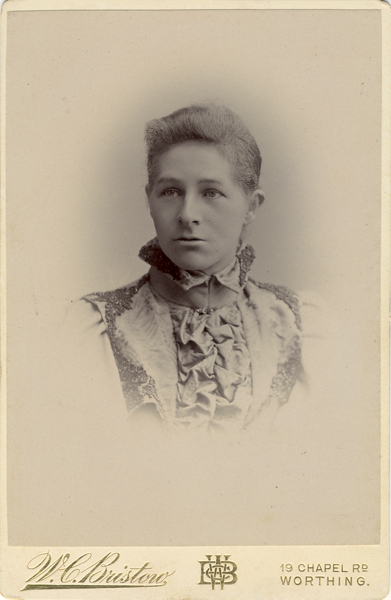 [ABOVE] A Cabinet portrait of a woman by W. C. Bristow, 19 Chapel Road, Worthing (c1896).Studio Proprietor : Mrs Eliza Bristow. 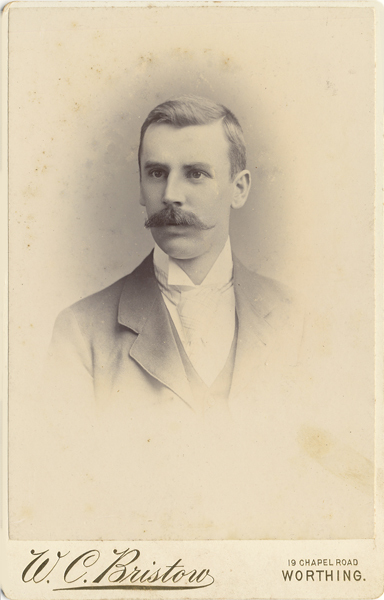 [ABOVE] A Cabinet portrait of a man with a moustache by W. C. Bristow, 19 Chapel Road, Worthing (c1900).Studio Proprietor : Mrs Eliza Bristow. 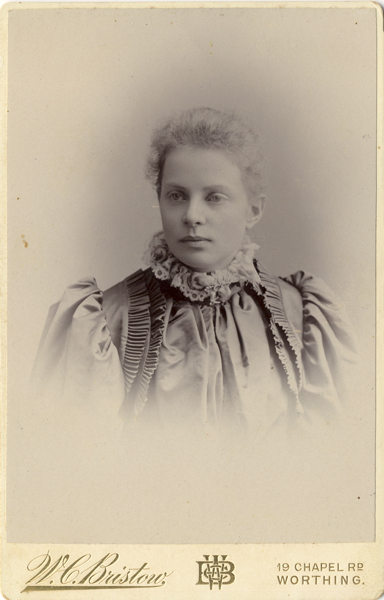 [ABOVE] A Cabinet portrait of a young woman by W. C. Bristow, 19 Chapel Road, Worthing (c1900). Studio Proprietor : Mrs Eliza Bristow. 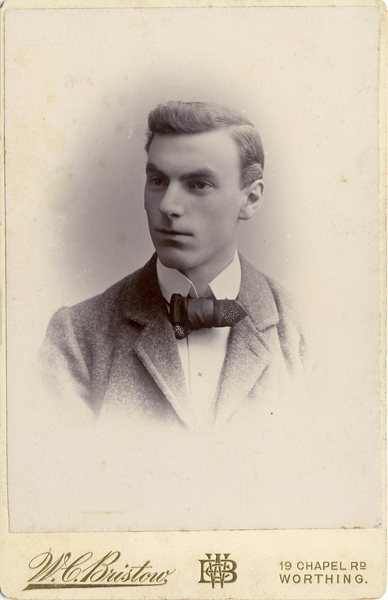 [ABOVE] A Cabinet portrait of an unknown man by W. C. Bristow, 19 Chapel Road, Worthing (c1900). Studio Proprietor : Mrs Eliza Bristow. [ABOVE] A Cabinet portrait of a young woman by W. C. Bristow, 19 Chapel Road, Worthing (c1900). Studio Proprietor : Mrs Eliza Bristow. 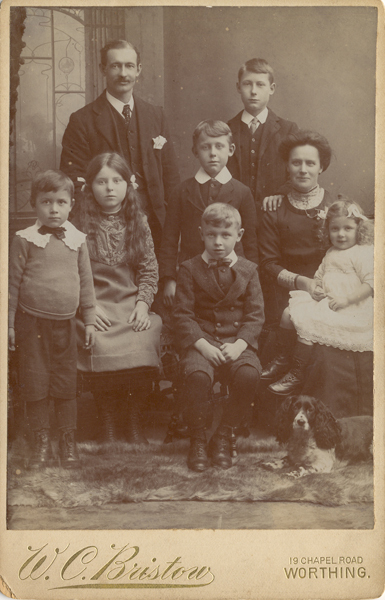 [ABOVE] A Cabinet portrait of a large family group by W. C. Bristow, 19 Chapel Road, Worthing (c1907). Studio Proprietor : Mrs Eliza Bristow. 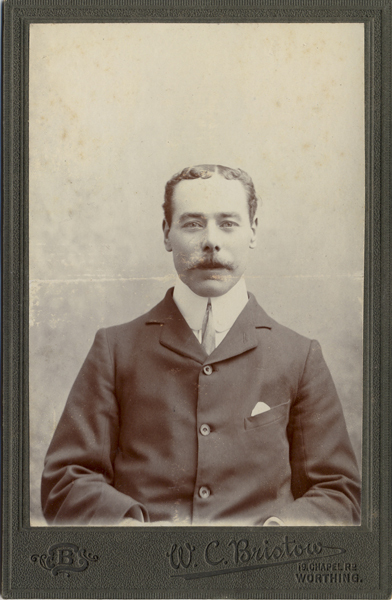 [ABOVE] A Cabinet portrait of an unknown man by W. C. Bristow, 19 Chapel Road, Worthing (c1907). Studio Proprietor : Mrs Eliza Bristow. 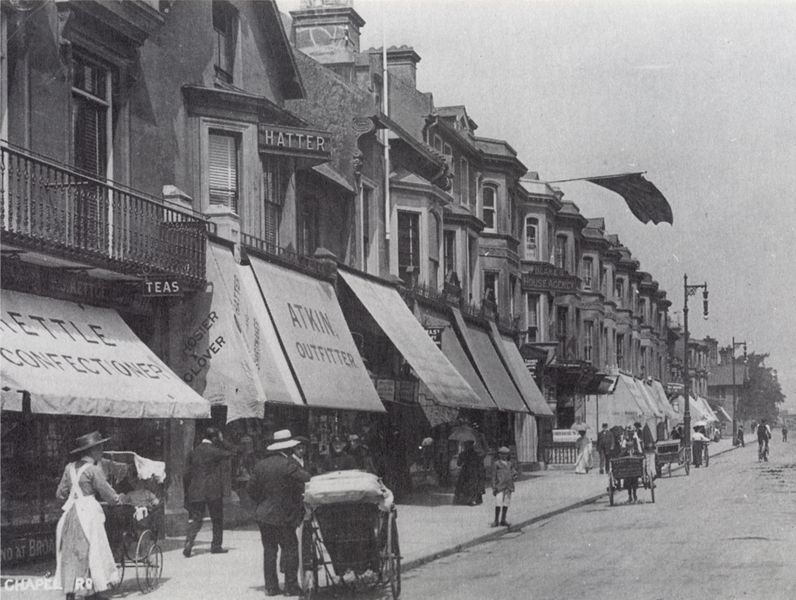 [ABOVE] Chapel Road, Worthing, photographed around 1905. A banner projects from the business premises of auctioneer and house agent John Blake at 17 Chapel Road. The building carries the sign "Blake's House Agency". Immediately to the right of John Blake's offices is the shop and studio of Mrs Eliza Bristow, the proprietor of "W. C. Bristow", Art Photographers" at 19 Chapel Road. 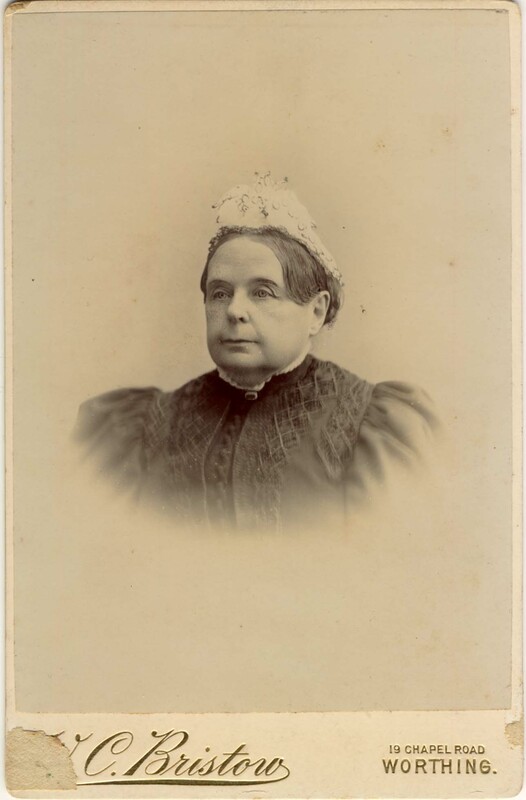 Mrs Eliza Bristow operated the studio of her late husband Walter Charles Bristow at No. 19 Chapel Road from 1896 until about 1918. On the left of the picture are the shops belonging to William James Kettle, baker & confectioner (No.7) and Edith Atkin, gents' outfitter and hatter (No.9a). [ABOVE] The trade plate of W. C. Bristow, 19 Chapel Road, Worthing, taken from the reverse of a cabinet card (c1896). 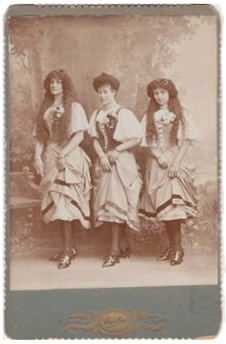 Although the portrait photographs produced at 2 South Street, Worthing from 1896 carry the name of "W. C. Bristow", the proprietor of the studio was Mrs Eliza Bristow, Walter Bristow's widow. 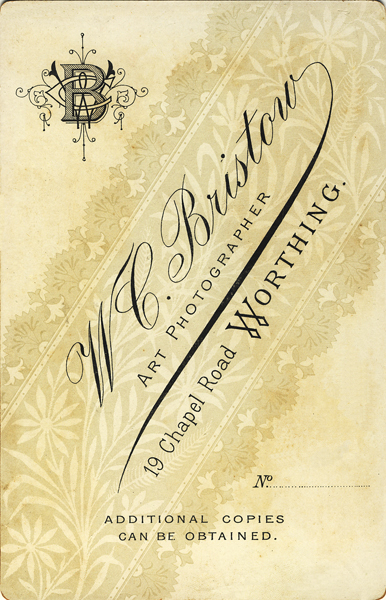 Walter Charles Bristow had died in Worthing on 2nd March 1896, aged 34.